(Francisco Kjolseth | The Salt Lake Tribune) BYU quarterback Zach Wilson runs through drills as the team opens preseason training camp on their practice field on Thursday, Aug. 2, 2018. Provo • With Beau Hoge having been moved to running back last week, most of the praise and attention in the BYU starting quarterback derby of 2018 has been focused on senior Tanner Mangum and sophomore Joe Critchlow. Those two have the most college football experience playing the position, by far. Mangum was the only quarterback made available at Media Day in June and was lauded by quarterbacks coach Aaron Roderick and offensive coordinator Jeff Grimes for the way he dropped more than 20 pounds and earned the respect of his teammates with his efforts to come back from an Achilles injury. Critchlow is the odds-on favorite to start on Sept. 1 against Arizona, according to an offshore sports book, and assistant coach Ed Lamb called him the next all-time great QB at BYU while speaking to alumni in Cedar City a week before camp opened. But don’t be fooled. It is looking more and more like the two main candidates for the starting spot are Mangum and the true freshman, Zach Wilson. 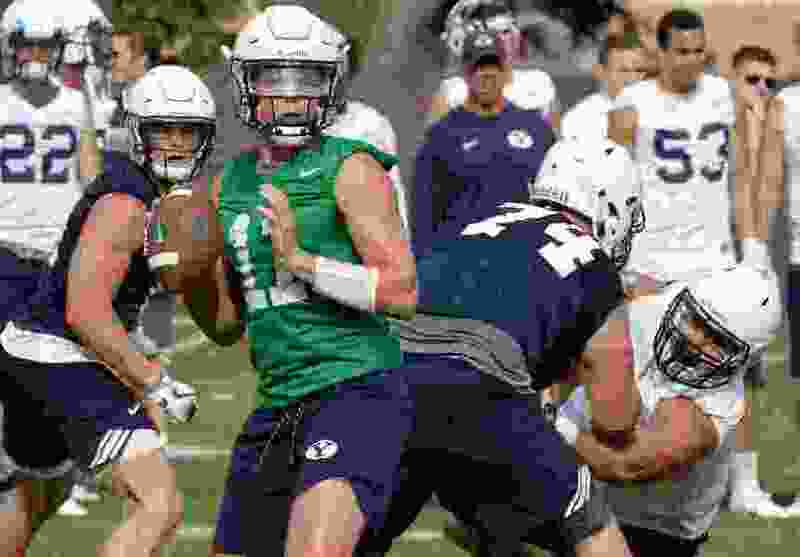 “We are still not [willing] to say anything right now [regarding the quarterback derby],” head coach Kalani Sitake said after Monday’s practice. However, in the media viewing portion of practice Monday, Mangum, Wilson and supposed fourth-stringer Jaren Hall were the only quarterbacks who took snaps in the team (11 on 11) drills. Critchlow did not get any reps.
Critchlow was not his usual smiling self when he left the practice field a few minutes before the other QBs stopped working for the day. Let the speculating begin. Asked if anything could be deduced from Critchlow getting no reps in the day’s final team session, Grimes shook his head. Critchlow did get his share of throws in the 7-on-7 work later in the practice. Wilson, who graduated early from Corner Canyon High in Draper so he could participate in spring ball, has sparkled in the portions of the camp that have been open to reporters, and has also looked sharp in other drills, according to observers who have seen all or most of every practice. He was made available for interviews Monday for the first time in preseason camp. Friday, Wilson threw three straight outstanding passes to Moroni Laulu-Pututau, Neil Pau’u and Matt Bushman. Monday, he connected with Talon Shumway and threw nice balls that were dropped by Bushman and running back Riley Burt before nice tosses to Kyle Griffits, Dylan Collie and Inoke Lotulelei. Asked where he sits on the depth chart, Wilson just smiled and shook his head. Wilson also shook his head when asked if coaches have told the candidates the timetable to name the starter. For the time being, it appears the Cougars have found their two right guys. • Tanner Mangum, Zach Wilson and Jaren Hall got reps in the final 11 on 11 drill of Monday’s practice; sophomore Joe Critchlow did not. • Former receiver Beau Tanner has rejoined the team and practiced at cornerback on Monday. • Coach Kalani Sitake acknowledged that sophomore defensive end Langi Tuifua is not currently practicing with the team due to an injury.